Two of the biggest problems that we have in our vineyards are disease (often weather related) and pests (insects that can cause and spread disease). In the case of vineyard pests there are many different preventative measures that can be employed, some more aggressive than others. The use of phytosanitary treatments is the easy option, albeit far from being the most natural, and we now spend our time looking for more suitable options, in our quests for mindful, sustainable fruit production. One method is by the use of pheromone traps, which causes confusion and should prevent mating of the insects – a method that we use in our own vineyards. However, a new and more innovative method is being studied in other wine regions of the world…. bats. 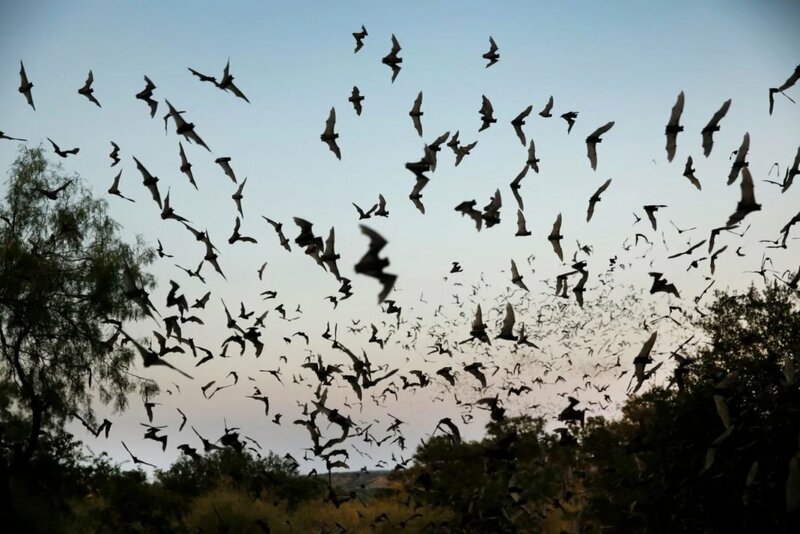 Studies have been carried out in France over a three year period using bats as a method of pest control. It appears that certain species of bat will feast on both the grapevine moth and the cochylis moth – it is known as BatViti… The result has been that the amount of pesticides required has been “significantly” reduced, and only really need to be used as a last resort. Of course, the species of bat used is critical (I guess), as there are, of course, some species that feed on fruit and would enjoy a veritable banquet in our vineyards! Assuming that you don’t drink a full bottle at every sitting, then what is the best way to preserve your wine and keep it as fresh as possible? Of course, there are hundreds of gadgets on the market, each one claiming better results than the competition, but in reality, you can start by doing two simple things. Push the cork back in, or find something airtight to reseal the bottle, and put your bottle in the fridge – by far the simplest solution that usually works pretty well (and can be applied to both red and white wines). 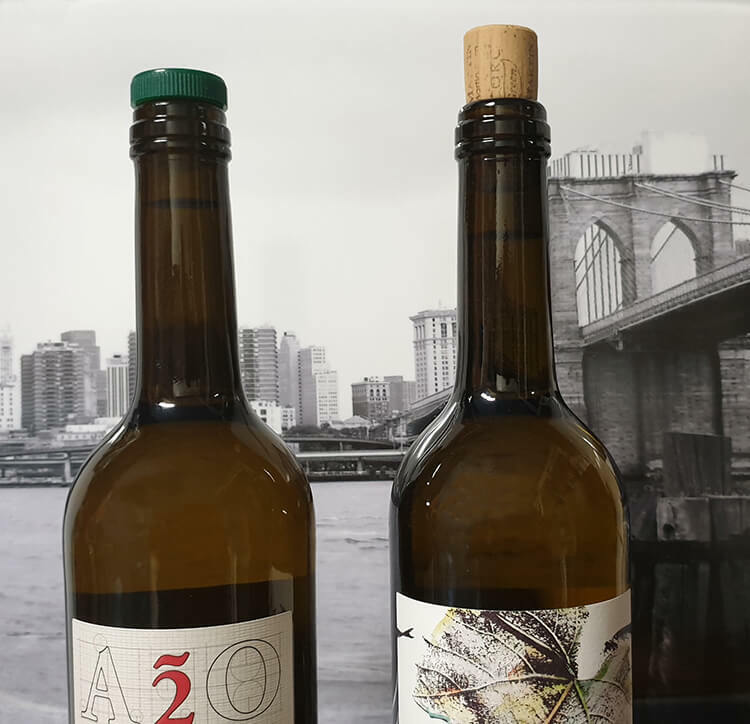 How long the bottle will actually keep, once it has been opened, really depends on a number of factors, such as the quality of the wine, how it was made, and how old the wine is when first opened. Without getting too technical if a wine is made correctly and has a good ‘structure’ then it will usually survive a bit longer than a cheap and cheerful wine that gives it’s all as soon as it is opened and then can deteriorate quite quickly. In the case of our own albariño the structure, and therefore it’s ageing potential, is enhanced by the extended lees contact. The lees at the bottom of the tank absorb oxygen, protecting it and adding complexity. It also sets the wine up for maximum protection against oxidation (this is the very simplified version of what actually happens!). Suffice to say that our ‘sobre lias’ process adds to the shelf life of our wine. Despite wine bottles being sealed with a cork (or some other form of closure), oxidation starts in the closed bottle. This can be influenced by the type of closure used, but it never stops completely. Indeed, a perfectly hermetic seal can potentially cause other types of problems – but that’s a whole other story. The point is that oxidation (the main reason why wines deteriorate over time), is an ongoing process during the life of a bottle, and this is simply accelerated enormously by removing the cork. If the wine in question has spent several years in bottle, it will already be slighty oxidised, and once opened will tend to fall apart rather more quickly. Hence that fact that younger, fresher wines will usually survive longer in your fridge. Heat, or even warmth, will also help to accelerate the ageing process, which is why a fridge is recommended. Simply remember to take out a red wine shortly before you want to drink it, or otherwise just let it warm up a little in the glass. As a follow up to my ramblings about natural wine, I thought that I should write a little about food trends too. After all, food and wine are very closely related and both subject to innovation and fashion. Admittedly, I am a little cut off from the main centres of food fashion, being out here on a limb, virtually in the middle of nowhere, but I will have a go regardless. Whilst ‘painting pictures’ on a plate might seem a bit outdated, presentation of food is still important, and dishes must still have eye appeal, one way or another. One slightly strange trend is that some chefs are not only desperate to discover new ingredients to cook, and different styles to incorporate, but they are also taking the presentation of their dishes to the extreme, using all sorts of odd receptacles on (and in) which to serve their food. Meanwhile, ingredients themselves are changing, as we are now being encouraged to eat odd cuts of meat and fish, that we perhaps haven’t tried before. Bellies, brains, cheeks, combs, ears, gizzards, hearts, hocks, kidneys, lungs, marrow, necks, shanks, spleens, tongues, trotters, and even testicles are all appearing with much greater frequency on our restaurant menus. Not to mention a whole range of edible plants that can be added to the list. Experimentation in food is spreading like wildfire, fuelled by a whole army of celebrity chefs, cookery programmes and TV competitions. Meanwhile, on the internet, the competition for likes and clicks is fierce – and so, in may ways, the more outlandish and unique your dish, the better. 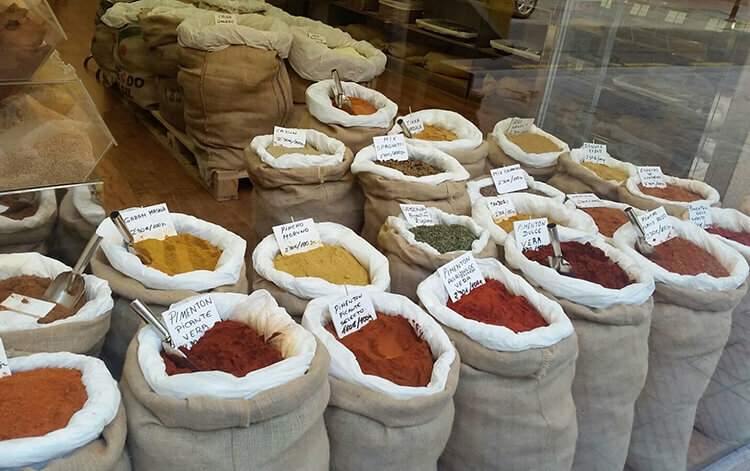 We are very rapidly adapting, modifying and re-defining the way we cook and eat, and often in a very positive way. After several weeks of dry sunny weather, and temperatures sometimes reaching as high as the mid-20’s C (68-75°F), since the beginning of April we have witnessed a big change. Nights are suddenly just a degree or two above freezing and daytime temperatures are barely reaching double figures (°C). Not only that, it is raining – but we can’t really complain – we really need it! Obviously this cold, wet weather makes it feel like winter again, and our big jackets that had maybe been packed away, are now very much the order of the day again. 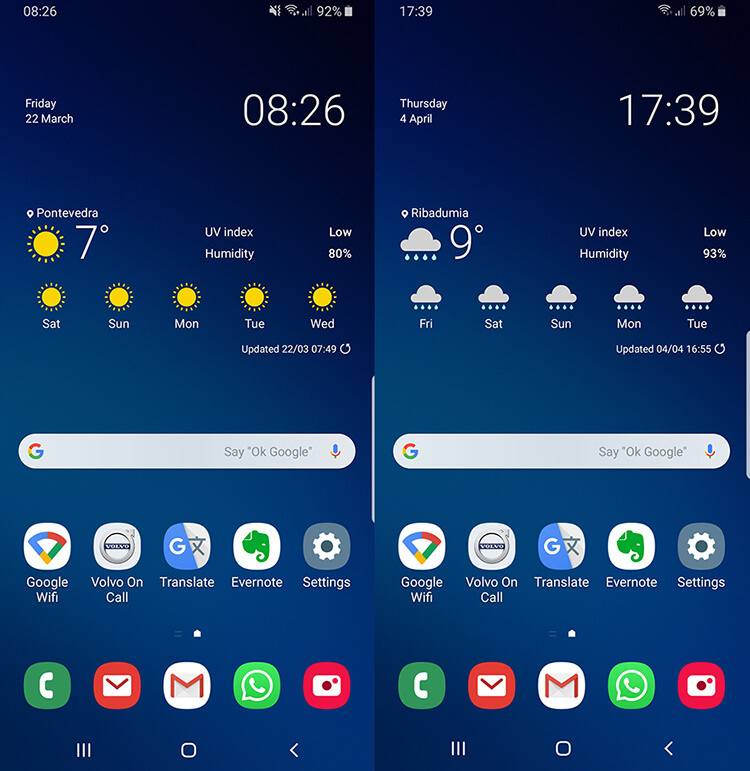 OK, so today’s picture is only two screengrabs from my phone, one from two weeks ago, and the other from today – but simply by looking at the weather icons you can really see the difference (even if a daytime temperature is not displayed). To be honest, I was scratching my head trying to invent a story for April Fool’s that would be both funny and yet plausible, but then it happened all by itself. A trivial story, but so stupid that it’s almost beyond belief. I am expecting an envelope from Portugal (Porto to be more accurate), which was sent on Friday via UPS. 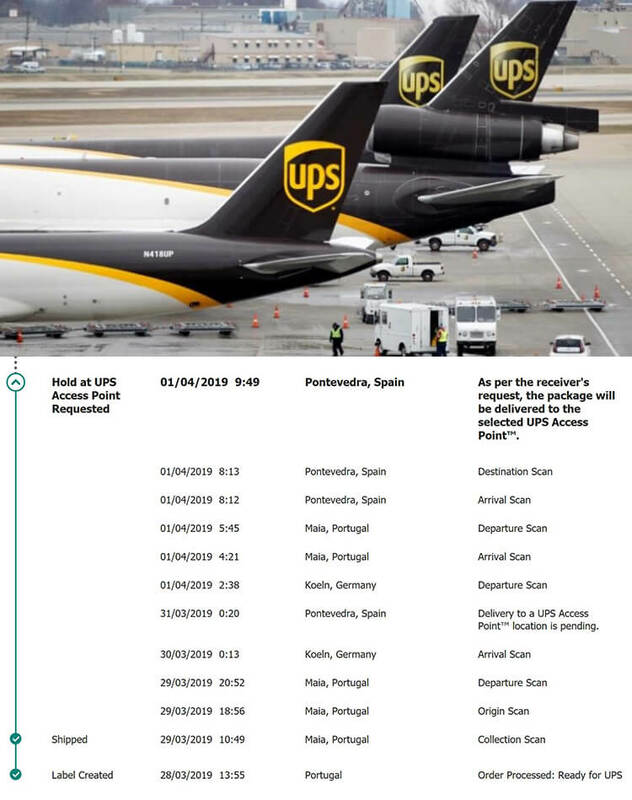 It left Maia, the main UPS depot just north of Porto on Friday evening (only about 150km from it’s destination here in Pontevedra), and arrived back in Maia at 4 o’clock this morning. Apparently it had been for a little weekend excursion to Köln in Germany (for reasons best known and understood only by logistics companies), adding a mere 3,200 km to it’s journey. And here we are doing as much as we can to reduce our carbon footprint! Imagine walking into a restaurant where the information on the wine list was restricted to merely the wine colour and country of origin. For example, you would be offered French red or white, Spanish red or white, Chilean red or white and so on. It would be a complete lottery and you probably wouldn’t be too happy about it… By simply adding the grape variety it would add a whole new level of information, and you might be at least be a little more confident about your selection. Of course, the importance of varietal does not only apply to grapes, but also to many other fruits and vegetables. However, the problem is that retailers don’t always pass this varietal information on to the consumer. In the case of apples, pears tomatoes and a few other products variety is usually clearly indicated, but there are still just too many exceptions for my liking. Here in Spain there is one, nearly always omitted, that particularly annoys me. Potatoes! Over here, potatoes are usually only distinguished by use or recommendation. For example, for frying, for boiling, for garnish (whatever that means), and my personal favourite, potatoes for cooking! The latter leaves me wondering how many people eat them raw? Whilst I realise that for the majority of people this might be sufficient information, there are still two problems that arise. 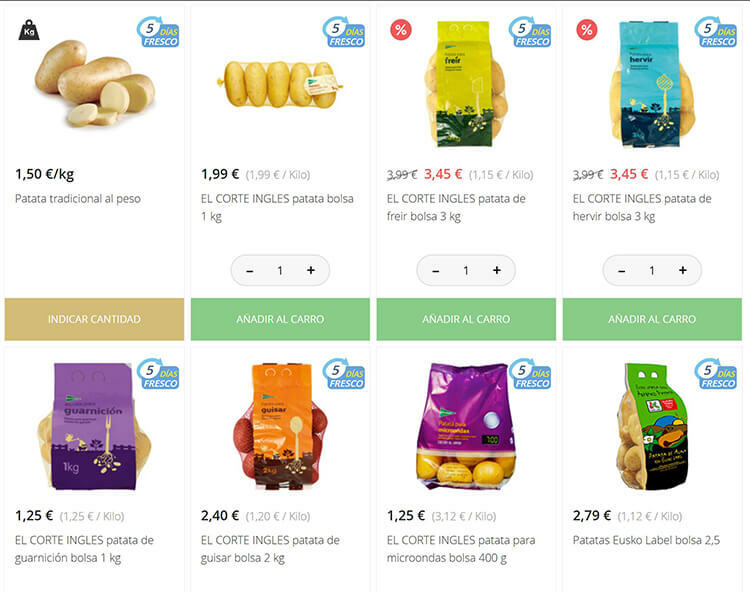 Firstly, the potatoes sold under each grouping are not always consistent, and more importantly, they are not always as advertised. For example, ‘frying’ potatoes that simply do not brown and refuse to crisp (even at super high temperatures). By simply including the variety it would then be much easier to avoid repeating this mistake again it the future. Before you read my text, take a look at the picture and see if you can spot the glaring mistake (from the Guia Peñin). Did you see it? Well, apparently Mexico City is now in Russia, or perhaps Moscow is in Mexico, there certainly seems to be some conflict in the message (but hopefully no conflict on the ground). 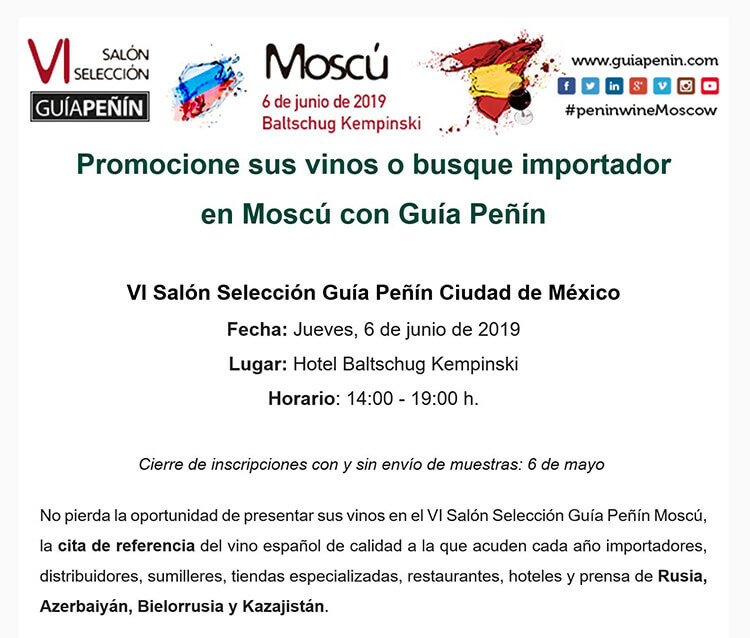 The only things I can say is that it’s a good job that Peñin make wine guides and not atlases!! Meanwhile, back in Spain, we have had a short week. Tuesday was Father’s Day (or San José), and so in at least some parts of the country it was a festivo (bank holiday). Of course, many businesses, including ourselves, added a ‘bridge’ day and enjoyed a long weekend. I can safely use the word ‘enjoyed’ because the weather is extremely sunny, and will be for at least the whole of the coming week. Our vines are already well advanced for the time of year and the sunshine will only help to accelerate this even more. The only (slightly) good news is that the air temperature is deceptively cool, especially at night. The airflow that we have is from the north, meaning that night time temperatures are falling as low as 6°C (42°F) and during the day barely reaching 20°C (68°F). Certainly, if it wasn’t for the cooler airflow we would probably be well into the mid-20’s. If this continues we could be in for an early harvest in 2019. 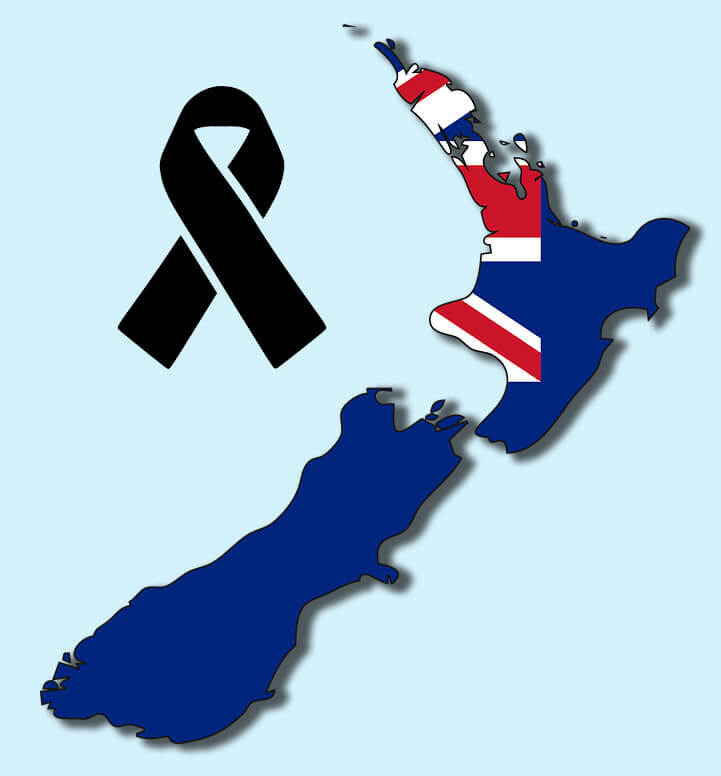 Our thoughts and prayers are with the people of New Zealand, but most especially with the friends and families of those who were so senselessly killed and injured on this terrible, black day. In a restaurant I want my food served on a plate, it can be any shape or colour, I really don’t mind, but on a plate please. An exception might be a scallop served in it’s shell, or other types of seafood – but even then they would still be served on a plate or platter of some sort. Fast food is of course, a whole different matter. I follow a site called “we want plates” which contains photos of some of the more outrageous and bizarre examples of how food in sometimes offered – some are quite hilarious. My favourite is actually a local Galician delicacy served “in the Dutch style”…. 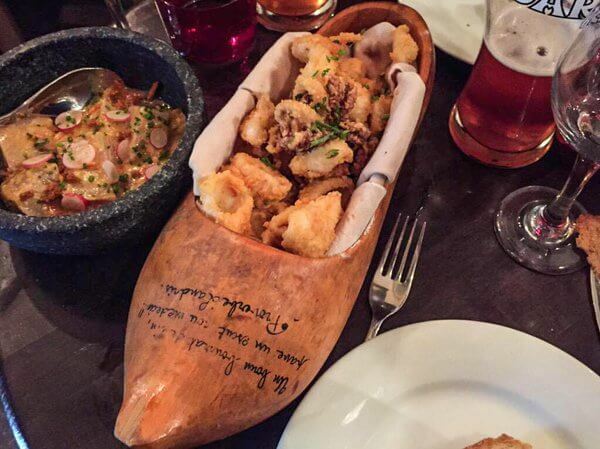 served in a clog!! Can they really believe that this looks appetising?